Services | HomeTown Bank, N.A. For a Lost or Stolen Debit MasterCard in US, please call (800) 500-1044. There is no charge for using a HomeTown Bank debit card at a HomeTown Bank ATM. ATM withdrawals will be included in the excessive withdrawal fee for savings accounts and the debit fees for applicable checking accounts. Debit MasterCard transactions will be included in the debit fee for applicable checking accounts. HomeTown Bank, N.A. may refuse the reissuance of a debit card for the following reasons: customer negligence, repeated lost cards or stolen cards. Availability of Deposits: Funds from deposits may not be available for immediate withdrawal. Please refer to HomeTown Bank N.A.’s policies governing funds availability for details. For added protection against fraud, please register your Debit MasterCard with 3D Secure by clicking here and then choosing “Register Now” at the top of the page.. HomeTown Bank has teamed up with SecurLock to give you real-time control of your debit card. Now, you can control how, when, and where your HomeTown Bank debit card is used. 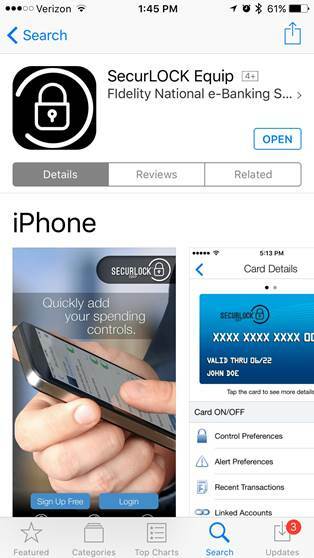 Just download the SecurLock Equip App on your Apple or Android smartphone. You can even receive instant notifications of transactions. It’s simple and easy, and you’re in charge! Mobile carrier message and data rates may apply.